This event is free; alums may register guests. 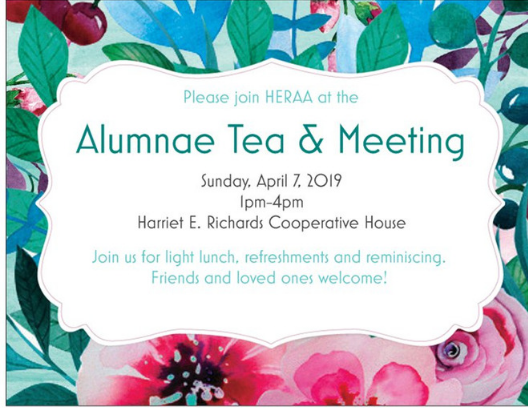 Join Harriet E. Richards Cooperative House residents and alumnae for the annual Alumnae Tea gathering and board meeting, hosted at 191 Bay State Rd on Sunday, April 7th from 1-4pm. Check out www.her-house.org/AlumnaeTea for full details about the event. To register online: click on the gray "Register" button and fill out your contact information. Alums may also register guests through the registration page. To register via email or phone: heralums.191@gmail.com or (617) 396-4371.